There are two types of Yathit subscription license 1) Individual and 2) Instance license. Once you purchase a license, the license will be assigned to a sugar domain. The sugar domain will be automatically assigned from your trial period. You can also send support email to change or assigned a domain to your license. Simply login to your Sugar inside Yathit. 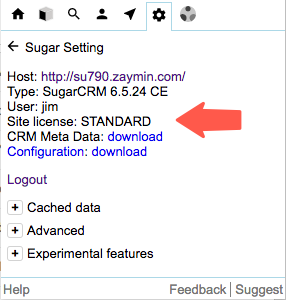 If your sugar domain has a license, you will see a license on the sugar login panel as shown below. Zero-cost Basic License is assigned by Google account login to Yathit browser extension. To received a basic license, simply login to Yathit in the extension. Users can assign a person via email to have access to the licence’s and ‘Subscriptions’ on the page. Any Google domain admin or a person who has access to the Admin Directory API can easily manage not only the bill payments but also the usage auditing as well. To do this, login to the Yathit Admin Portal. Note that the user has to be either a Google domain admin or someone who has access to the Admin Directory API. You do not have to use any special Google apps integration for using the Admin portal or to manage the users.